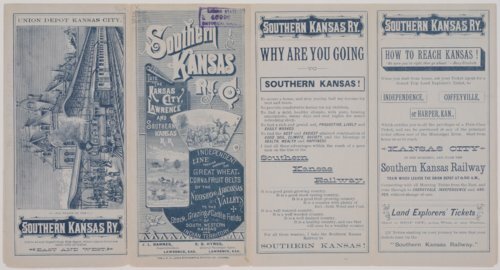 Map and timetable of the Southern Kansas Railway, previously known as the Kansas City, Lawrence and Southern Kansas Railroad. The route included branches to Lawrence, Burlington, Coffeyville, and Hunnewell. The railway encouraged settlement along 150 miles of the Oklahoma border with descriptions of the soil and schools for those emigrating to southern Kansas.